After years of conflict, the Allies are finally on the brink of victory. Cowering behind the walls of the Kremlin, the Soviets decide to turn to one last act of desperation - the use of an experimental time travel device. The mission: to go back in time to eliminate Albert Einstein before he creates the technologies that will lead the Allies to ultimate victory. After a successful mission, the Soviets return to the present, discovering the Allied position has indeed been weakened. But before they can truly celebrate, they find out their actions have spawned a new threat and global superpower, the mysterious, technologically advanced Empire of the Rising Sun. Welcome to World War III. 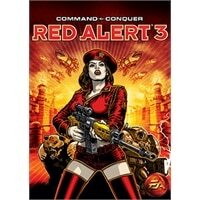 In Red Alert 3, all three factions will have their own hand-crafted story-driven campaigns, with co-operative missions designed solely around coordinating attacks and developing strategies with an ally. Hook up with a friend online and play through the entire campaign or recruit one of nine AI commanders to play at your side, each with their own distinct play style and personality. While most RTS games keep naval gameplay at the periphery, Red Alert 3 is not shying away from the high seas. The oceans now hold essential resources, and with many units and structures capable of becoming amphibious, players who turn their backs to the oceans will find conquering the world a daunting task. It’s Always Better With Someone Else - Fight your way through three campaigns solo, or join forces with your friends or one of nine, in-game commanders, each with unique personalities and play styles, in missions designed from the ground for co-op play. Star-Studded Storytelling - Command & Conquer‘s trademark live-action videos return in HD, with over 60 minutes of footage featuring the largest cast in the history of the Command & Conquer franchise. Ready Your Man Cannons - Armored War Bears, and Anime-inspired psychic school girls join your favorite Red Alert units like Sonic Dolphins, Tesla Troopers, Attack Dogs, and the ever popular Tanya. A New Threat From The East - The deadly Empire of the Rising Sun is a technological terror, with designs influenced by a mixture of anime, science-fiction, martial arts, and robot culture. The Empire’s futuristic units can transform into alternate forms, and they specialize in naval warfare.